The mission San Juan de Capistrano, California was founded 1776 by father Junipero Serra (Petra, Mallorca), with the help of Captain Fernando de Rivera. 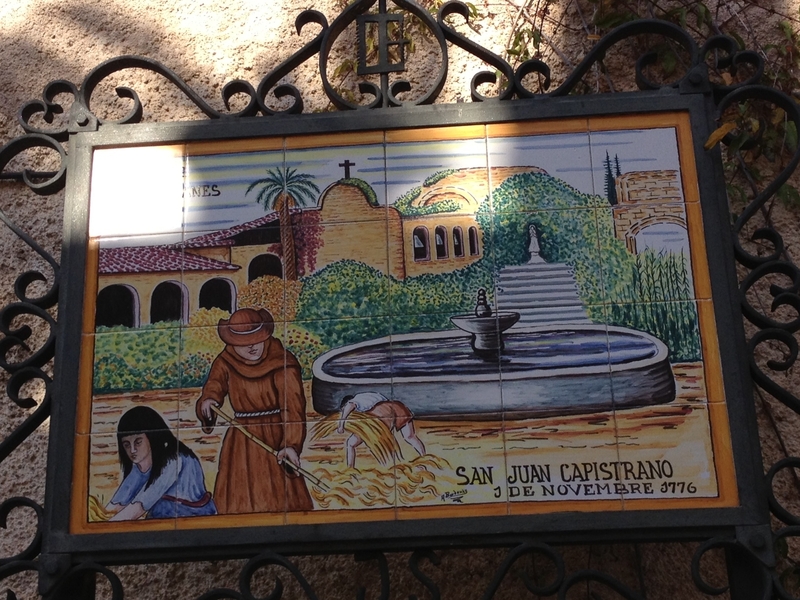 San Juan Capistrano, was the sixth mission founded in Californian lands, by Majorcan Franciscans , the organization of this new California mission was the responsibility of the fathers Amurio and Lassuen. Related to the number of baptisms carried out in this mission, we can ensure they were around 4340, marriages 1153 and deaths 3126 and new kids born around 900. San Juan Capistrano was a rich mission ,the jewel of the missions,reaching 16270 heads of cattle, being the most important beef cattle with 10900 heads, 4800 heads ovine cattle, 450 horses, 40 pigs, 30 mules and 50 goats. 1845 the mission San Juan Capistrano was sold to Juan Forster by 710U$, and he and his family lived there for 20 years. 1865 President, Abraham Lincoln, returned the mission to Catholic Church. The mission church was built in 9 years (1797-1806) and it collapsed during an earthquake 1812. In this old mission church, father Serra made a Mass and was there, where it happened the swallow miracle. The legend tells, Father Serra was celebrating a Mass on St. Joseph’s Day, March 19th, in San Juan Capistrano mission, when a swallow rested on his shoulder. But the bird did not move during the whole celebration and stayed on father Serra shoulder. When the Mass was over, the father Serra picked the swallow and saw that the bird had a broken leg, and he made a bandage on the bird´s leg, and let the swallow free, safe and sound. Since this day every 19th march, swallows are coming back to San Juan Capistrano. Because of swallows coming back to San Juan Capistrano, Rene Leon composed 1940 the famous song “when swallows are coming back to Capistrano”. And each year, a swallow festival is held in the mission San Juan Capistrano. Another curiosity the swallows left every year, San Juan Capistrano, to go to Goya Argentina (moving to the south) 23rd October, the death anniversary of San Juan Capistrano (a theologian living 18th century, the mission is reciving his name). Swallows flies at an average speed of 100 km an hour (62 miles per hour) and to reach Argentina, swallows cover a distance of aprox 10.000 to 12.000 km (6200 to 7456 miles). The flight to get there takes approximately 30 days and swallows are flying from the sun raising, early at the morning, to the sunset, and during the flight there are not eating or drinking. Let us guide you to Petra(Mallorca) ,the place where father Serra was born, and discover his homeland, the beautiful Mediterranean island, Mallorca. We are sure that father Serra never forgot Mallorca and always carry it on his heart. Come and discover with mallorca Private tour guides, Father Serra homeland. This entry was posted in Uncategorized and tagged 19th march, abraham lincoln, California, californian, church, Father, father serra, franciscans, guide, guides, homeland, Joseph´s day, junipero, lassuen, majorca, majorcan, mallorca, mediterranean, miracle, mission, missions, petra, private, rene leon, san juan capistrano, serra, St Joseph´s, swallow festival, swallows, swallows coming back to capistrano, the jewel of the missions, tour. Bookmark the permalink.